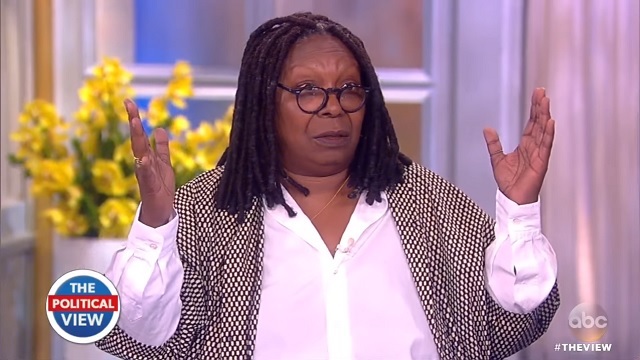 During a debate with Newt Gingrich on The View Tuesday, Whoopi Goldberg insisted Donald Trump got 98% positive media coverage during the election. Asked to make sense of Trump's low approval ratings, Newt Gingrich brought up a recent study from Harvard which found CNN had 93% negative coverage in Trump's first 100 days in office and said it's "a miracle that Trump has any approval" in such a hostile media environment. Goldberg responded by insisting repeatedly that from the moment Trump "came down the escalator until the time he won, he was 24/7 on every television" and "it was all positive," to the tune of "98%." GINGRICH: I think it's amazing, if you look at the -- for example, CNN's 93% negative coverage according to Harvard, 93% negative, I think it's a miracle that Trump has any approval. JOY BEHAR: Oh, my God. BEHAR: I have a question, too. GINGRICH: It wasn't all positive! SUNNY HOSTIN: It was live coverage of Donald Trump was saying. GINGRICH: It was all noisy but it wasn't all positive. WHOOPI: No, no. 98% of it was positive, Newt. This is what Hollywood liberals actually believe.